We've partnered with Gold Peak Tea to help you throw a party with a personal touch. 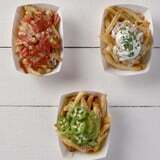 Fries are already a crowd-pleaser, but let's get personal! This loaded-up DIY fry bar lets guests get creative with a delicious selection of toppings for their fries (and it's impossible to go wrong). To help you get the party started, check out how to make our favorite combos — taco fries, pizza fries, and nacho fries — all paired with the perfect flavor of Gold Peak Tea. Why choose just one!? Cook french fries per the instructions on the bag. Put the french fries on a large plate, and surround the fries with all the topping choices, displayed in similar sized bowls. Any topping that you would like to serve hot can be microwaved. We recommend heating the carnitas, marinara sauce, and nacho cheese sauce. If you would like melted cheese on your pizza fries, simply cover the french fries in cheese and put them in the microwave for a minute, then top with marinara and pepperoni!